N. Hall, digitally constructed photo montage, “Women of Red River,” (2012). Click on the image to embiggen. Key, in rows, left to right, beginning from the top: ♦ Letitia Bird (photographed 1858); Jane Inkster/ Mrs. Tait (photographed c. 1915); Anne Christie ‘Annie’ Ballenden (born 1837); Clothilde Bruneau/ Mrs. J.F. 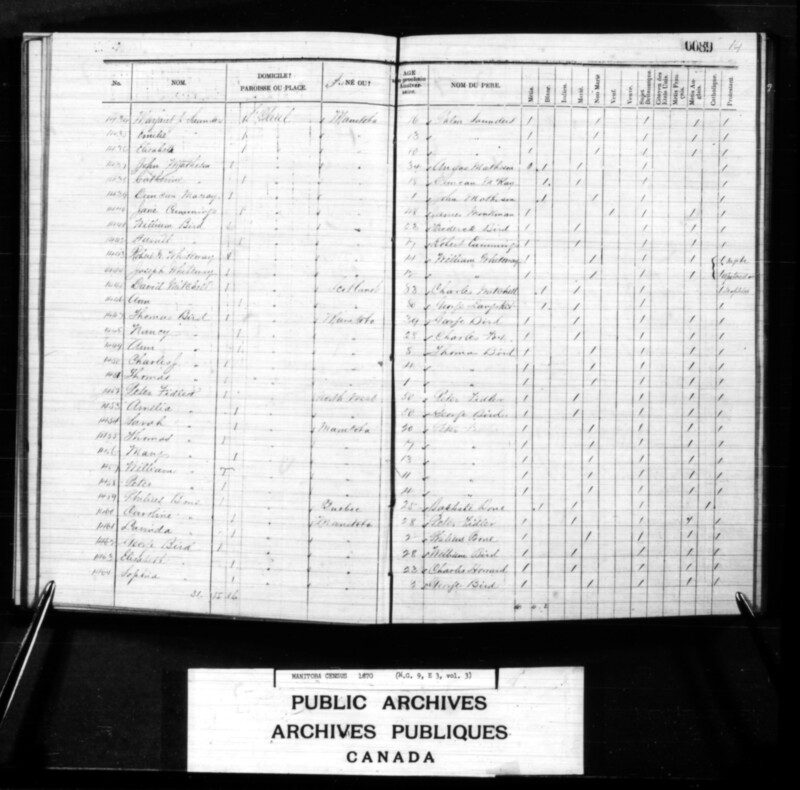 Grant (born 1850); Catherine McDermot/ Mrs. T. Truthwaite Sr. (born 1823); Julie Lagimonière/ Lagimodière/ Mrs. Riel Sr. (born 1822); Rosalie Hogue (born 1859). ♦ Mary Jane Flett/ Mrs. B. Isbister (born c. 1862); unidentified Dakota woman (photographed 1909); Sarah ‘Sally’ Ross (born c. 1798); Hélène Dease/ Mrs. Patrice Bréland (born 1841); Marguerite Gosselin (born 1829? or 1842? ); Caroline Pruden/ Mrs. T. Sinclair Sr./ Mrs. A. Sargent (born c. 1830); Nellie/ Mrs. Isbister and daughter (unknown); Reine Lagimonière/ Lagimodière/ Mrs. Monette dit Belhumeur/ Mrs. Lamaire (born 1807). ♦ Anne ‘Annie’ McDermot/ Mrs. A.G.B. Bannatyne (born c. 1832); Henrietta Ross/ Mrs. Rev. John Black (born 1830; died 1873); Caroline Charcote/ Turcotte/ Mrs. Geo. Thos. Inkster (born 1859); Clothilde Bruneau/ Mrs. J.F. Grant (born 1850); Helen/ ‘Mrs. John Taylor’ and infant (unknown); Henriette Riel/ Mrs. J.-M. Poitras (born c. 1861); Priscilla Grant (unknown). ♦ Mary Anne Begg/ Mrs. W. Isbister and infant son (born 1846); Eliza Renville/ Mrs. Jerome (born 1868); Jane Elizabeth Still/ Mrs. W. Drever Jr. (unknown); Elizabeth ‘Lizzie’ Ballenden (born 1839); ‘Mrs. Lépine’ (unknown); Jean Fulsher (unknown); ♦ Angelique Jerome dit St. Mathe/ Mrs. J. Rollette (born c. 1826); unidentified “Scottish Métis” woman (unknown); Catherine McBeth/ Mrs. T. McKay (photographed c. 1874); [inset below:] Jean Anne Drever/ Mrs. Pinkham (born 1849); ‘Mrs. James Rutherford‘ (unknown); Anne ‘Annie’ McDermot/ Mrs. A.G.B. Bannatyne (born c. 1832); Mary Isbister/ Mrs. J.E. Pruden (born 1844); ♦ Eulalie Riel/ Mrs. W. Gladu (born 1854); Marie-Anne Plamondon/ Mrs. St. Germain (unknown); Harriet Goldsmith Sinclair/ Mrs. Dr. W. Cowan (born 1832); unidentified Saulteaux woman and infant (photographed 1895); ‘daughters of James Isbister‘ (unknown); Nancy Loutitt/ Mrs. W. Calder (born 1849). In an overview of the field of Métis studies published in 2001, historian Frits Pannekoek commented on only two articles that touched on the 1869 Resistance while focusing on women. The one was Diane Payment’s “La Vie en Rose?” (1996).” The other was Natalie Kermoal’s “Les Roles et les souffrances des femmes metisse lors de le Resistance de 1870 et de la Rebellion de 1885″ (1993).” Pannekoek noted that Kermoal described Métis women “as passive participants. Their role was private, one of keeping the family intact and providing domestic support for the political or public activities of their men. Women were subordinate, suffering within the confines of a world controlled by men.” Pannekoek credited Payment with emphasizing the role of the Catholic Church in encouraging the “subordination of women,” though mainly after 1869. The most prevalent approaches to studying the Métis appear to reflect the Euro- and andro-centric (emphasizing males) biases of source materials, historiographical traditions, and past research cultures. If the contribution of Aboriginal women to community life has been downplayed or misunderstood, then, contrary to mainstream historiographic representation, women [at Red River] may in fact have been central to Métis community formation, the configuration of values, and social cohesion. … [Given an unbroken history of predominantly Aboriginal maternal influence during childhood] … it is unlikely that Métis social norms were gender-determined in a manner which privileged male European approaches. Within their own sphere, women shared information and decided matters of importance to their survival. Their cultural background did not predispose them to adopt an entirely passive or submissive stance with respect to their spouses and decision-making regarding their families or themselves. Outward deference does not necessarily indicate inner abnegation. As of 2012, little has been added to formal, academic historiography that would shed light on the role of women during the Resistance — whether Aboriginal or non-Aboriginal. There has been work done on illuminating the lives of Métis women at other settlements (see for example Diane P. Payment, “ecclectica – Marie Fisher Gaudet,”(1843-1914): ‘la Providence du fort Good Hope’“). A recently published text, edited by Lawrence Barkwell, Women of the Metis Nation 2d ed. (1st ed. 2009; Winnipeg, Louis Riel Institute, 2012), includes one article, by Tod Lamirande, related to women’s involvement and influence at Red River during the period of the resistance. Reference to that text is included below. There are more stories in older sources, however, that indicate political activism was engaged in by women at Red River Settlement. The stories suggest that being denied a formal vote at a council, convention, or assembly did not mean women did not influence the opinions expressed at such meetings. Frits Pannekoek, “Metis Studies: The Development of a Field and New Directions,” From Rupert’s Land to Canada, ed. Theodore Binnema, Gerhard J. Ens, and R.C. MacLeod (Edmonton: University of Alberta Press, 2001), 111-128. Diane P. Payment, “‘La Vie en Rose?’ Métis Women at Batoche, 1870-1920,” in Christine Miller and Patricia Chuchry, eds., Women of the First Nations: Power, Wisdom, and Strength (Winnipeg: University of Manitoba Press, 1996), 19-38. Nathalie Kermoal, “Les Roles et les soffrances des metisses lors de la Reisistance de 1870 et ge la Rebellion de 1885,” Prairie Forum 19, no. 2 (Fall 1993): 153-168. See also Nathalie Kermoal, “‘Le Temps De Cayoge’: La Vie Quotienne Des Femmes Métisses au Manitoba De 1850 a 1900,” Ph.D. diss. (Ottawa: University of Ottawa, 1996). Norma Jean Hall, “‘A Perfect Freedom’: Red River as a Settler Society, 1810-1870,” M.A. thesis (Winnipeg: University of Manitoba, 2001), 66-70. Link to: a recent examination of women and farming at the settlement in Norma J. Hall, A Casualty of Colonialism: Red River Métis farming, 1810–1870 (2015). Wife of Hon. Andrew G.B. Bannatyne of the Legislative Assembly of Assiniboia, Anne is credited with striking “the first blow in the struggle for representative government at Red River,” when she objected to the behaviour of the ‘Canadian Party’ by publicly denouncing Charles Mair‘s letter writing campaign. She gave him a thrashing — in view of residents of the Town of Winnipeg — with her riding crop. He was compelled to leave the settlement, and only allowed to return on the condition that he cease the offensive writing and issue a public apology (which he did). Anne was related, directly and by marriage, to some of the most influential families in the settlement. To begin with, her sister Mary Sarah ‘Sally’ McDermot Mactavish had been ‘First Lady’ to HBC Gov. William Mactavish at Upper Fort Garry since 1858, and continued to hold the position through the Resistance. Both Sarah and Anne were aunts-in-law to Louis Riel as well as ‘cousines’ to a number of the members of the Legislative Assembly of Assiniboia — French and English, Catholic and Protestant. Tod Lamirande, “Annie McDermot Bannatyne. (1830-1908),” in Women of the Metis Nation 2d ed., edited by Lawrence Barkwell (Winnipeg, Louis Riel Institute, 2012), 23-35. Daughter of James Sinclair who defended Pierre-Guillaume Sayer in the ‘Free Trade’ trial of 1849, and cousin of Hon. Thomas ‘Young Tom’ Sinclair of the Legislative Assembly of Assiniboia, Harriet was the wife of Dr. William Cowan, Hudson’s Bay Company Chief Trader at Fort Garry during 1869 to 1870. She lived with her husband within the fort during the Resistance. Some accounts of the Cowans’ experience at that time (including the version relayed by Healy, Women of Red River, after interviewing Harriet Cowan) describe the stay at the fort in negative terms. Historian N. E. Allen Ronaghan, however, argues that documentary evidence suggests otherwise. W.J. Healy, Women of Red River (Winnipeg: 1923), 47-48, http://www.ourroots.ca/page.aspx?id=4096943&qryID=c8aef4ea-0e71-460d-8230-1a5266fa4a9b. Virginia Barter, “Reflections, Riel and Red River Women,” Métis Voyageur (Fall/Winter 2006): 18, continued 29, who supplies a narrative based on a number of stories from Healy, Women of Red River. See also N. E. Allen Ronaghan, “Cowan, William,” Dictionary of Canadian Biography online [DCB]; “Dr. Cowan,” New Nation 2 June 1870 (notice of the family’s departure from the settlement); “Dr. Cowan,” New Nation (16 June 1870), biographical note. Did Sara Riel help to create a flag for the Provisional Government led by her brother Louis? To date, it is anyone’s guess what the flag(s) of the provisional government(s) might have been. However, because the flag had to be sewn by hand and women were likely to do that work, and because one obvious coterie of women available to do that work resided at the convent in St. Boniface: if the flag was stitched together by the Sisters of Charity of Montreal/ Sœurs de la Charité de Montréal/ Grey Nuns/ Sœurs Grises (one of whom was Sarah Riel; all of whom celebrated the Sacré-Couer/ Sacred Heart), and they used available materials (including flags already on hand), then they might have combined elements from a Hudson’s Bay Company flag (for the Union device), a flag known as the Carillon-Sacré-Coeur (for the fleur de lys), all arranged on a white ground (the French colonial standard/ battle flag in North America), with added embroidery (the ‘shamrocks entwined’), copied from the crest of the home city of their religious order, Montreal, with a result similar to the illustration above. See “Flags and the Red River Resistance,” this site. A sister to Louis Riel, Sara was a Grey Nun residing and teaching at the Catholic complex at St. Boniface during the Resistance. In subsequent years she taught at the boarding school at Ile a la Crosse where she adopted the name Sister Marguerite-Marie after a near-death illness. Brief mention of Sara’s circumstances during 1869 and 1870 is made by Lesley Ericson, “Repositioning the Missionary: Sara Riel, the Grey Nuns, and Aboriginal Women in Catholic Missions of the Northwest,” in Recollecting the Lives of Aboriginal Women of the Canadian West and Borderlands, ed. Sarah Carter and Patricia McCormack (Edmonton: Athabasca University Press, 2011),127, 128. Married to Louis Riel Sr. and mother of Louis and Sara Riel (see above), Julie was subjected to harassment by men associated with the Canadian troops who arrived after the creation of Manitoba in 1870. She apparently held her own quite capably, given that her home and self survived, though her experiences must have been traumatic. Lesley Ericson, “Repositioning the Missionary: Sara Riel, the Grey Nuns, and Aboriginal Women in Catholic Missions of the Northwest,” in Recollecting the Lives of Aboriginal Women of the Canadian West and Borderlands, ed. Sarah Carter and Patricia McCormack (Edmonton: Athabasca University Press, 2011), 128-129, refers to the above incident. Cousin to Janet Macbeth Sutherland [see below], she spent the winter of 1869-1870 in the Settlement. Considered a “jolly good girl,” she was rumoured to have flirted with Riel. Agnes is one of Manitoba’s historical enigmas. Her father, reputedly, was James Farquharson. Stories about the origins of Agnes Campbell Farquharson (if that was her real name) are inconsistent. Her year of birth is generally understood to have been 1840. By some accounts she was born at Georgetown, British Guiana; by others, at Aberdeen, in Scotland. She arrived at Red River some time between 1862 and 1867, when she married the anti-Provisional Government agitator ‘Dr.’ John Christian Schultz (a medical fraud, land speculator, and leader of the Canadian Party). Agnes was full partner to Schultz’s progress during and after the Resistance (ethical or otherwise). Agnes Campbell Farquharson Schultz, How to Provide Good Reading for Children(Toronto: Bryant Press, 1895), http://archive.org/stream/cihm_24720#page/n3/mode/1up, notes on the cover that the advice was priced at 10 cents per copy. One final thought: given that Agnes apparently was a writer as well as an avid reader, it is possible that she contributed to the production of the New Nation while it was owned by her husband. She may have done much of the other writing attributed to him as well, seeing as his illness supposedly made such work difficult. Wife of John Sutherland and mother of Hugh John/John Hugh Sutherland, who was one of three young men to die during the resistance. Janet interceded to save the life of ‘Major’ Charles Arkoll Bolton, who had been arrested along with a group of men from ‘the Portage’/Portage la Prairie accused of being responsible for Hugh John’s death. Daughter of Janet Macbeth Sutherland and John Sutherland [see above], Catherine witnessed the events of 1869-1870 as a child. She married William Ross Black. See her reminiscences in Healy, Women of Red River, 222-228, http://www.ourroots.ca/page.aspx?id=4097118&qryID=c8aef4ea-0e71-460d-8230-1a5266fa4a9b. Katherine Jane Glen Macaulay Rae Hamilton Begg/ ‘Mrs. Alexander Begg,’ niece of Dr. John Rae who discovered the fate of Sir John Franklin’s arctic expedition; had ties to a number of HBC families (for example, two sisters-in-law were daughters of Peter Skene Ogden Jr.); wife of A.G.B. Bannatyne’s business partner, Alexander Begg, whom she married in 1868. In the spring of 1870, the New Nation (6 May 1870), reported that Katherine had left Red River with her brother, identified only as “Mr. Hamilton,” to go to Hamilton, Canada, where she would be visiting friends until the next spring. Mrs. Burdick, wife of the “popular” purser of the HBC steamer International, went aboard with her family to take a trip to visit friends in the States (6 May 1870), http://manitobia.ca/content/en/newspapers/NNT/1870/05/06/5/Ar00501.html/Olive. Jane Elizabeth Still/Mrs. W. Drever [Jr] and Miss Drever aboard the river steamer International 15 May 1870, bound for Pembina [New Nation (20 May 1870)] (not to be confused with Helen Rothnie (of Aberdeen, Scotland)/Mrs. William Drever Sr. or the latter’s daughter Jean A. Drever). See The Drever Women, this site. Mrs. Sonderman, St. Paul, notice of arrival at Emmerling’s Hotel printed in New Nation (2 June 1870). She appears likely to be the wife of J.J. Sondermann, tailor at Winnipeg (see ad http://manitobia.ca/content/en/newspapers/NNT/1870/05/10/3/Olive ). Lizzie Emmerling, Germany, notice of arrival at Emmerling’s Hotel printed in New Nation (2 June 1870). As far as I know, Clara was Métis. Her father (William Gilbert Bird) and mother (Harriet Cummings) identified as such for the 1870 census (see nos. 1441-1442 on a scan of the page online). Her father also took scrip (see a scan of his application online). All of which means she would not likely have belonged to a band that took treaty. obviously like your web site however you need to check the spelling on quite a few of your posts. Many of them are rife with spelling problems and I in finding it very troublesome to tell the reality nevertheless I will definitely come back again.